I generally hide the fact that I’m disabled. Not because I am ashamed. But because I was told I couldn’t achieve my dreams by various teachers and other school officials and counselors. They felt my ‘limitations’ would prevent me from understanding the odds against me. They were wrong. I already knew it wouldn’t be easy. I have learning disabilities, but I am not entirely oblivious to the world around me. So, how does writing fit in to this? Because my dream is writing! I was ten years old when I realized I wanted to be an author. Growing up, I’d doodle about on paper, spinning endless stories in my head and yet, I never seemed to finish them. That’s because I would falter and let those negative voices ramble on in my mind; the ones that told me no one would ever read anything a disabled girl wrote. Those days weren’t often, but they did happen and I’d sigh, putting my journals aside until the next time a burst of stubborn bravery hit me. I never gave up dreaming about writing, even if I did frequently put it on the back burner. Of the many things I struggle with daily, the hardest one concerning writing, by far, is comprehension. I have a hard time understanding certain things, such as verb tense and it can be frustrating. It slows me down but I’ve found a small circle of people I trust to not speak down to me and patiently explain the process. Several times. It comes down to this: If you want something bad enough, you have to be willing to work hard at it. There is never a time when you should ease back or give less than. The only true failure comes when you give up or give in. I’ve begun to incorporate some disabilities into my characters. I hope that there may be someone out there who will read and feel understood, to know they are not alone at all and that those of us with disabilities …our only limits are the ones we place on ourselves. 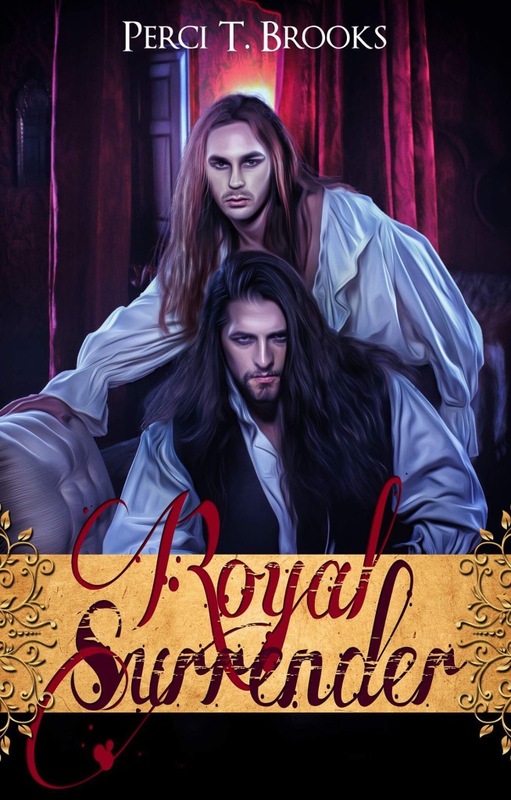 Check out an EXCLUSIVE excerpt from Perci T. Brooks’s novel Royal Surrender below! The servant shifted, biting his lip and attempting to stifle the groan the movement caused. Amory could tell the man’s knees were aching. How long had Floyd kept him in this position? Another furtive attempt to move away caught the king’s attention and he dealt another blow to the servant’s already-reddened face. Raising his arm once more, the king snarled when Amory grabbed it, holding it in midair. “Unhand me,” the king commanded, staring daggers at Amory. The prince stood between his father and the servant. He didn’t speak right away, and when he did, he lowered his tone, never breaking eye contact. “With your merciful permission, Your Majesty, I’ll take him. He’ll answer to me, or to Covyll if I am not present.” He paused, choosing his words. “A king of your stature shouldn’t be worrying about the affairs of one lone servant.” Amory knew he was taking a gamble, banking on the fact that as much as his father loved using brute strength and fear as weapons, he also liked playing the benevolent ruler when it suited him.